Damage from water infiltration to properties occurs not only from hurricanes winds potentially throughout the year in Florida. It’s important to buy products that meet higher design pressures to protect your value investment. General Impact products offer enhanced protection from water infiltration. 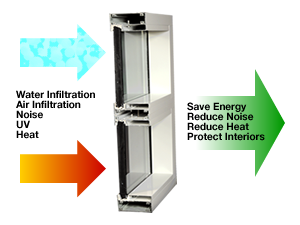 Air leakage from windows and doors can rob your home or business of energy efficiency. Our windows and doors are designed to meet the most rigorous code on the world. When replacing the old non-impact windows and doors, your energy consumption can be reduced every month. Low-e coated glass will improve that efficiency even more. All of our windows and doors are made with a high standard commercial-rated aluminum and tempered 6063-T6 aluminum alloy. Overall thickness is 0.80. The frames and sash are made to resist impact and high pressure. Installing Miami-Dade County and Florida Building Code approved impact-resistant windows and doors could qualify you for a reduction in your property insurance. Check with your agent for details. The 12000 series Fixed Glass Wall is designed and tested to meet and exceed design pressures without the need for steel reinforcement that typically requires steel inlays that often corrode when in contact with Aluminum. 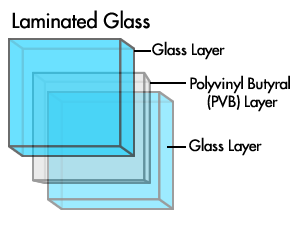 Insulated glass refers to two or more lites of glass sealed around the edges with air space between to form a single unit. Commonly referred to as an “IG Unit”, insulated glass is the most effective way to reduce air-to-air heat transfer through the glazing when used in conjunction with Low-E and / or reflective glass coating. IG Units become an effective means to conserve energy and comply with energy codes. 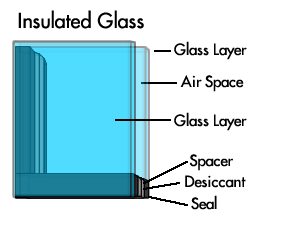 The most common architectonical insulating glass unit configuration is 9/16” glass/ ½” air space/ ¼” tempered glass. Laminated glass is two or more lites (pieces) of glass permanently bonded together with one or more plastic interlayer (PVB) and S. G. P. using heat and pressure. The glass and interlayer can be a variety of colors and thickness designed to meet building code standards and requirements. Laminated glass can be shattered but fragments tend to adhere to the plastic layer and remain largely intact, reducing the risk of injury. Laminated glass is considered “safety glass” because it meets the requirements of the various code organizations that set standards for safety. Heat-strengthened and tempered glass can be incorporated into laminated glass units to further strengthen the resistance to impact and hurricane force winds.